Helen Marie Perrine, 91, walked and even ran into heaven on Sunday, January 27, 2019, at 5:00 p.m. at the Roseville Rehab and Healthcare Center. She was Born at home in Roseville Township, November 20, 1927, the 3rd daughter of Harland Elsworth and Flossie (Simmons) Ewing. She grew up on the family farm near Berwick and attended Carr School. She graduated from Roseville Twsp. High School in 1946 and attended Gem City Business College in Quincy. She moved to Long Beach, CA, to work for Sears. She then moved to Chicago, where she was an executive secretary in the sporting Goods Catalog Dept. She contracted Polio in Chicago, in 1949, at the age of 21, which changed her life forever. For the last 70 years she has borne the effects of that disease. She was not expected to survive, to walk again or have any children. Her strong spirit showed them otherwise. She was dating Paul Perrine at the time of her illness, and they married two years later on April 15, 1951. She walked down the aisle on his arm, wearing full leg braces. Together they owned and operated Paul’s Appliance and Service in Roseville, from 1952, until his death on August 31, 1985. She continued to run the business for 7 more years before retiring. Helen grew up in the Berwick Baptist Church and transferred her membership to Roseville Baptist Church in 1963. 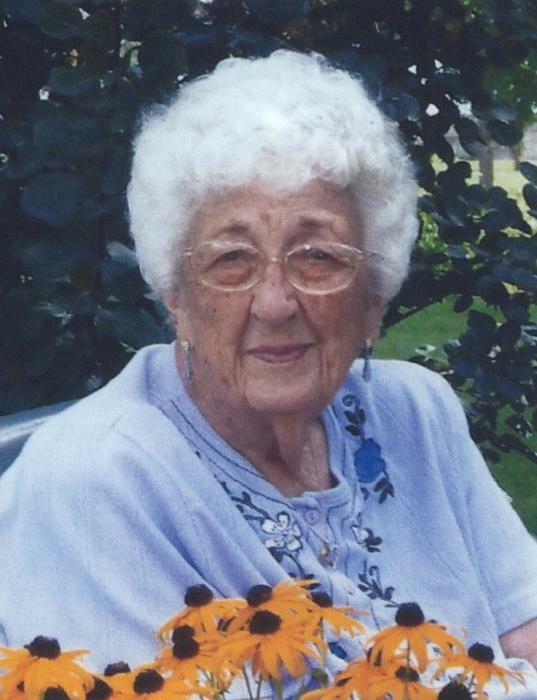 She was a faithful member, treasurer for 18 years and was on the church board for over 50 years. She was a Girl Scout leader when her daughters were young, and a member of the Roseville Woman’s Club and acted as President 3 times. She and Paul loved to travel and made trips to several foreign countries through their business. They had a cabin on the Mississippi for 20 years, where weekends were spent during the summer. Helen is most known for her oil paintings, which numbered over 900. She won 70 ribbons and 2 People’s Choice Awards. She was most proud of the roses she designed for the Roseville Water Tower. Helen had written a book of memoirs for her family in 2009, and they all were gifted a copy. She began writing a weekly column, “I Remember”, for the Roseville Independent newspaper in 2012. Her last column was #320. She even had one written to be published after her death. Helen is survived by her children Janis (Robert) Johnson, Marla (Steve) Higgs and Van (Hilde) Perrine. Her grandchildren are Melissa Johnson-Skillin, Brian Johnson, Eric and Paul Higgs, Shawnee Huston and Step-granddaughter Heather Nickles. Her seven great grandchildren are Tristin, Brynn, Ellison, and Brecken Johnson, Ruxin and Palmer Higgs and Quinn Skillin. She was preceded in death by her parents, husband, and sisters (Lois Darrow and Bessie Cogley). Funeral service will be Saturday, February 2, 2019, 11:00 a.m. at the Wise family Funeral Home Roseville, IL. Dwight Taflinger will conduct the service. Visitation will be Friday eve, February 1, 2019 from 5:00-7:00 p.m. at the funeral home. Burial will be in the Roseville Memorial Park Cemetery Roseville, IL. In lieu of flowers, memorials may be made to the Roseville Baptist Church, and/or the Roseville Ambulance Service. Please sign the online guest book at www.wisefamilyfuneralhome.com. Wise Family Funeral Home Roseville, IL is in charge of the arrangements.